I am really happy with the way this turned out! Although the picture would have you think otherwise, all the edges do V out in a nice pattern. Pattern - Heartstrings Hanging Vines Scarf with 2 center panel repeats (73 stitches total). I purchased the pattern at Elann. Finished Measurements - 20"x60". It should really be longer and a bit narrower but that's as long as my blocking board goes. I'm going to have to either get blocking wires or an inexpensive rug runner if I plan to make more of these. Comments - The yarn was a dream to work with. It didn't split and even behaved well on the K3tog's. Blocking took all of a couple hours. I washed it with Eucalan (the water did get pink but no noticeable color was lost), pinned it on my blocking board and turned on the ceiling fan. 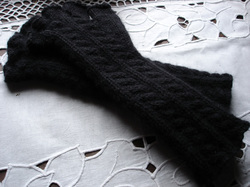 As I mentioned above, I will look into buying blocking wires if I get the lace knitting bug. 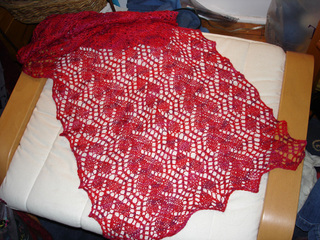 And since I have 3 more hanks of Anne in my stash I think there's a good chance I'll be making more lace scarves!